Can you imagine greater flexibility in your hips, knees, fingers, and every other joint in your body? Want to experience a day, a week, a year without joint agony? Herbal FLEXSolve 24/7 is ready to give your joints a new lease on life and is one of the best joint supplements on the market. In just days, you can begin to experience a life without joint problems and discomfort. Give yourself a total joint makeover with FLEXSolve 24/7. Experience the freedom of moving with ease. No more wincing when you walk, run, or climb stairs. Now you can stay away from dangerous pills and their side effects. 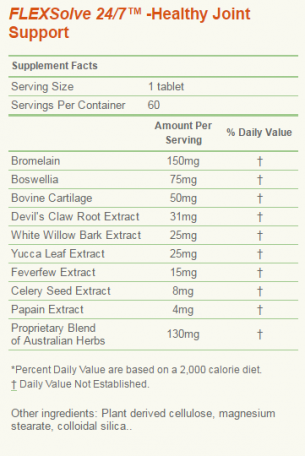 FLEXSolve 24/7 contains 13 European and Australian herbs that work together to make you more flexible and fast for superior joint relief! Try FLEXSolve 24/7 and see a difference or we’ll refund the full purchase price, no questions asked! 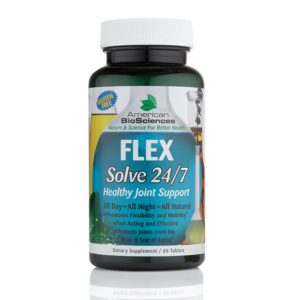 FLEXSolve 24/7 provides the superior joint relief and support you need and fast! You’ll feel the difference after just one bottle! 90-Day Money Back Guarantee – No Questions Asked! Herbal FLEXSolve 24/7 is ready to give your joints a new lease on life and is one of the best joint supplements on the market. In just days, you can begin to experience a life without joint problems and discomfort. Give yourself a total joint makeover with FLEXSolve 24/7. Do not use if you are hypersensitive to any ingredient in this formula or allergic to pineapples or papayas. Pregnant or lactating women and individuals taking prescription medications should consult a healthcare professional before use. This product is absolutely without any doubt the best available for any kind of issue…including lower back. It is well worth what you will spend VS doctors. Flex Solve works from the inside/which is where the nerves are located and within a few minutes there is mobility and NO ISSUES!! magic dust” is NOT one of those. Seriously if you have lower or upper back issues, and are tired of products that just help for a little while, please try Flex Solve and be amazed! You owe to to yourself to be problem free. Click here for research on FLEXSolve 24/7.